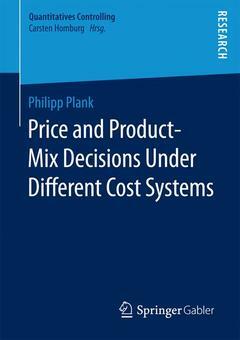 Philipp Plank analyses the question, what drives the quality of cost-systems and is the quality of cost-systems directly and at best positively related to the firms? performance. In other words, is it worth investing in complex cost allocation systems or are there environmental and/or production settings in which less enhanced systems perform adequately. Using simulations, a benchmark firm (first-best solution) perfectly allocating cost to products is compared to firms implementing heuristic cost-allocation schemes (second-best solution) to identify the profit gap resulting from decisions based on limited information. Into this discussion, the idea of cost-stickiness is integrated, thereby indicating a new planning approach. About the adequacy of full-costing for decision making.- From cost system design to pricing and portfolio decisions.- About the adequacy of simulations in management accounting research.- A theory review of relevant simulation models in management accounting.- Price and product-mix decisions under different cost systems.- Extended decision model incorporating cost-stickiness. Philipp Plank received his doctoral degree from the University of Cologne under the supervision of Prof. Dr. C. Homburg. He now works as a project manager und data scientist.